This story originally appeared on our content partner Dragon Trail. On November 26, 2018, Visit Sweden became the first national tourism board to launch a WeChat mini-program for China Travel Academy (CTA) to train Chinese travel agents. 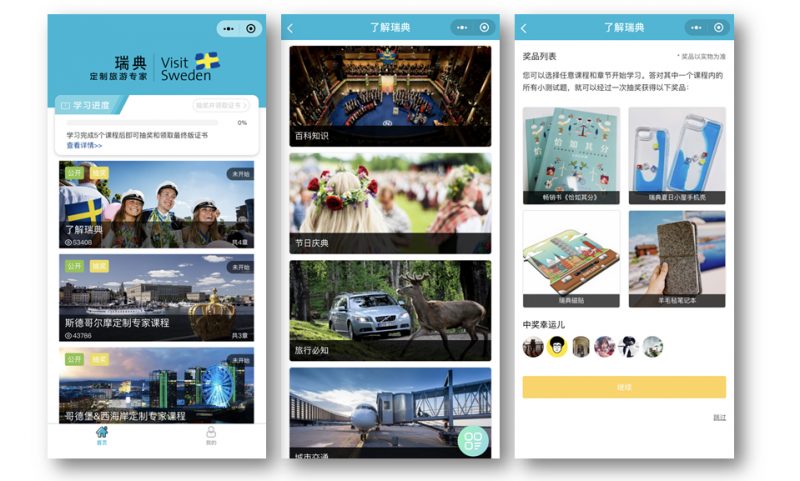 Sweden launched their first WeChat-based training program for Chinese travel agents in November 2015, with a second edition released the following year. From 2015-2017, Chinese arrivals to Sweden increased by 25 percent, making China Sweden’s fastest-growing inbound tourism market. For 2018, Visit Sweden took advantage of the newest technologies to update their B2B digital marketing in China. They offered CTA Live webinars in June and December 2018, and introduced the new CTA course via WeChat mini-program at the end of November. CTA and CTA Live courses are already available on WeChat and promoted to Dragon Trail’s database of over 33,000 registered Chinese travel agents. So why use a mini-program for CTA, as opposed to the traditional H5 format? Mini-programs have taken off since they were first launched at the start of 2017, especially in retail and travel, and there were a reported 1 million available by November 2018, with 200 million daily active users in August 2018. While there is a certain amount of hype around mini-programs, there are solid advantages, too, including their popularity with users. Mini-programs are extremely easy to find on WeChat – for Sweden, it’s listed under “Sweden Travel Expert” (瑞典旅游专家). Users can then save the mini-program to their favorites list for speedy access later on. A mini-program is the perfect way to launch a CTA program if your travel brand doesn’t have a dedicated B2B WeChat account, as the mini-program can exist on its own without being linked to an official account. A CTA mini-program also has all the same advantages of a traditional CTA course, including promotion to over 33,000 travel agents, flexible content and helpful user data capture. Visit Sweden’s new CTA mini-program includes five courses. Every course has three sections: an overview of the region; local resources classified by themes such as ‘family,’ ‘cuisine,’ ‘outdoors,’ or ‘shopping’; and recommended itineraries. The first course, ‘Understanding Sweden’ teaches the Chinese travel trade about Swedish nature, culture, government, holidays, vital travel information, and city transport. There are three city-based sections, for Stockholm; Goteborg and the west coast; and Malmo and the southern part of Sweden. The last section includes information on other parts of Sweden. The organization of the content provides practical resources for Chinese travel agents to learn about different parts of Sweden, and search for information when they are doing product planning for their clients. Each course contains information to study, along with vibrant photos, followed by a multiple-choice quiz, and the opportunity to win Sweden-branded prizes. In just over a month, the courses had received a total of more than 175,000 page views, with over 50,000 views alone for the first course.